Rocket Internet has another project in Europe, well at least it is backing another startup, this time one based out of Spain. Spotcap is a company focused on helping small business gain easier access to credit lines and loans. 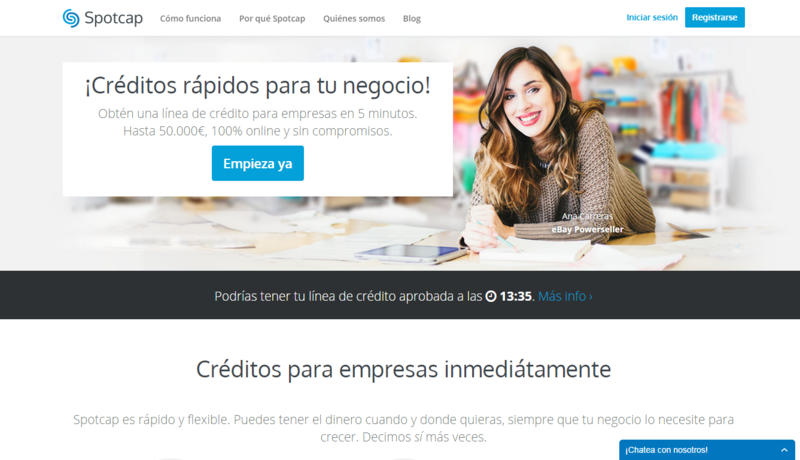 Initially serving the Spanish market only (to the point that its website is not available in English yet), the startup says it asseses “the real-life financial performance of customers rather than solely looking at customers’ financial history.” It’s not exactly clear what that entails — beyond “a unique algorithm” — but Spotcap says its service cuts out the need for paperwork and process, which makes it able to provide an offer to a customer within just five minutes of receiving their application online. Using a model similar to Wonga’s Everline service, Spotcap is able to offer credit lines from between €500 – €50,000. That’s the kind of sum that its founders believe could make all the different to a fledgling business that might struggle to tick the right boxes required by traditional financial institutions. Spotcap hasn’t revealed how much that Rocket Internet has invested in the company, but it is starting life with 30 employees spread across operations in Spain and Rocket Internet’s head office in Berlin, Germany. As mentioned above, the service is initially active in Spain only, where economic issues have made loans and general financial processes trickier. The company says that it plans to expand to more countries, and also widen its services to offer new financial products over time.